Our range of products include steel mop buckets. Our manufactured Steel Mop Buckets are the leading products in hard floor care. At our end, we manufacture a high utility domestic MOP buckets that are widely used in households and offices for cleaning floors. We make sure that we use only premium quality of raw materials for manufacturing our entire stock of Mop Buckets. Our clients have the choice between the steel Mop Buckets and plastic Mop Buckets. This type of bucket is provided with non-marking and non-rusting parts that makes it as the most preferred buckets among customers. 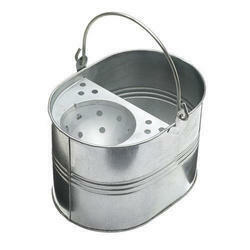 Our all the Mop Buckets are duly galvanized and offered in varied capacities. All the industrial predefined standards and norms are strictly followed while manufacturing these buckets. This type of MOP Bucket is basically used for cleaning floors in commercial places, offices, homes, hospitals and other public areas. Looking for Steel Mop Buckets ?